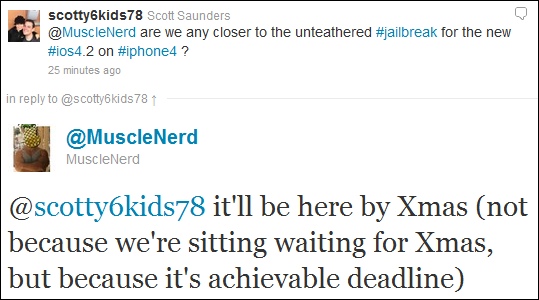 Earlier this month, iPhone hacker Comex mentioned on Twitter that an untethered jailbreak would be available before Christmas. It’s been over a week now and we hadn’t had any status update until MuscleNerd confirmed the release of an untethered jailbreak to be released before Christmas. Minutes after tweeting the above info, MuscleNerd deleted this tweet, which is nowhere to be found now. So why did he do this? My guess is that we’re indeed going to get an untethered (maybe even userland) jailbreak for Christmas, most likely for all iDevices. After tweeting about it, MuscleNerd probably felt like he talked too much and chose to delete the tweet rather than being harassed with questions about the upcoming jailbreak. In this case, I think MuscleNerd just wants to underpromise but overdeliver. That’s good news for jailbreakers. Hopefully we’ll also get some good news about the baseband downgrade tool that is reportedly in the works. As usual, time will tell. I haven’t updated my iPhone 4 to iOS 4.2.1 yet simply because I don’t want to have to deal with a tethered jailbreak. I’m sure a lot of you are in the same situation. Probably even more of you have updated to 4.2.1 and are now patiently waiting for the untethered miracle. Tell us about your situation in the comments section below. For more news coverage, you can follow us on Twitter or become a fan on our Facebook page, we will keep you updated with posts over the web.